This powder room design in Newtown makes a statement with amazing color and design features. The centerpiece of this design is the blue vanity cabinet, which is beautifully offset by satin brass fixtures and accessories. This powder room design in Newtown makes a statement with amazing color and design features. 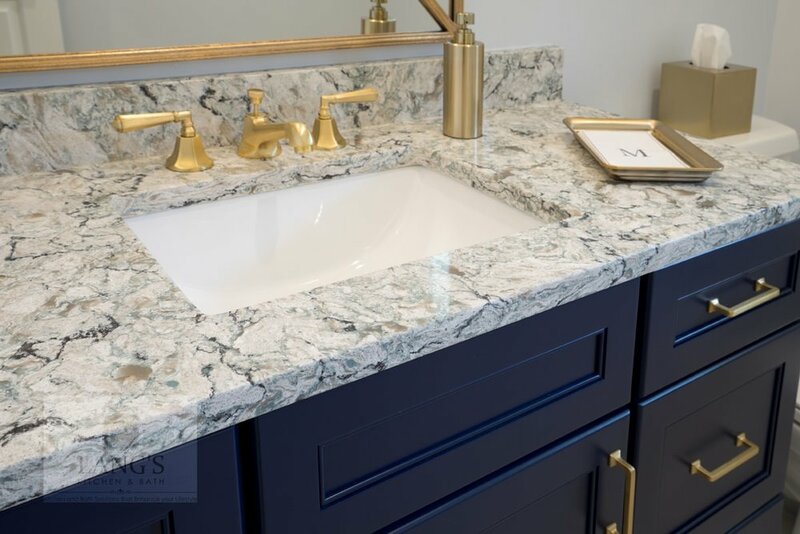 The centerpiece of this design is the blue vanity cabinet from CWP Cabinetry, which is beautifully offset by satin brass fixtures and accessories. The brass theme carries through from the Alno cabinet hardware to the Jaclo faucet, towel ring, Uttermost mirror frame, and even the soap dispenser. These bold features are beautifully complemented by a rectangular sink, Cambria quartz countertop, and Gazzini herringbone floor tile.